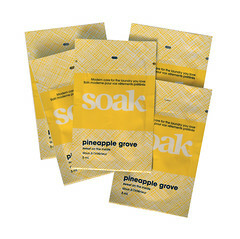 Here at Soak, we care about growing a sustainable business and minimizing our negative environmental impact. In everything we do we carefully consider our actions and how they affect the world around us. This is why Soak is dye and phosphate free, biodegradable, non-toxic, and our 3oz bottles are made out of 100% post-consumer resin. We are very proud to have created such a high quality product; however, creating that product is only a small part of what it takes to run our business. We believe it’s important to maintain these values throughout all aspects of what we do. Every day we ship products from our home in Toronto to destinations around the world. When it comes to stuffing our boxes and protecting Soak through the shipping process, we always opt for the first step in the magic triangle of reuse – reduce – recycle. 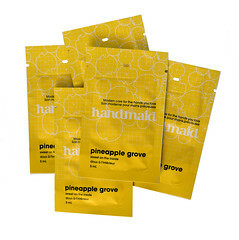 We want our products to arrive safe and sound whether the destination is Los Angeles, Berlin, Melbourne or Vancouver. It would be easier to use crisp new paper, boxes, bubble wrap, and foam peanuts. Instead, we collect shrink wrap from skids, scrap paper, used boxes and anything else that can be reused to keep Soak safe on its way from us, to you. The most difficult thing about using recycled leftovers in our packing is trying to keep all the odds and ends that come through our warehouse orderly and in one place. After brainstorming to find a solution, we realized the answer was right in front of us! 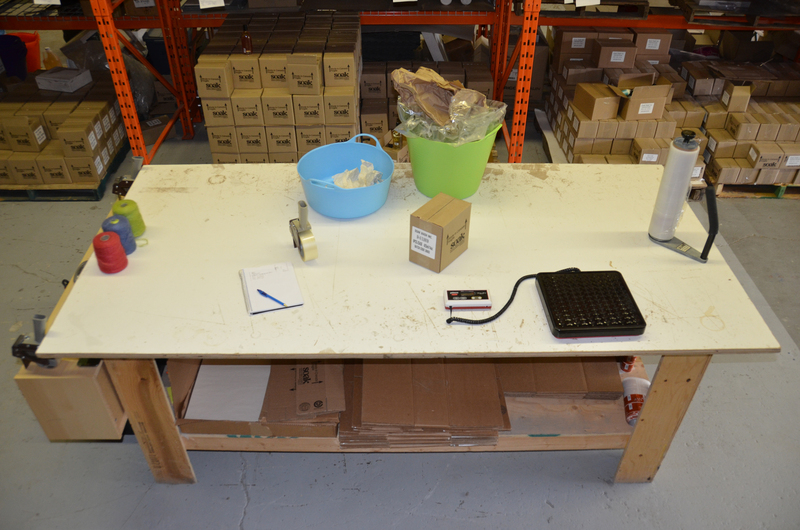 We now employ a host of Carrie and Phil basins to keep our packing supplies neat and tidy. We found this to be quite the testament to the innumerable uses of the versatile Carrie and Phil. 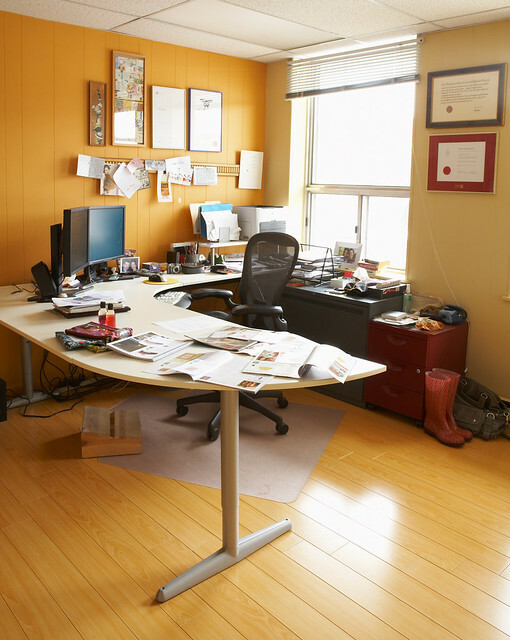 Do you ever feel like your entrepreneurial skills are not up to par with your creative instinct? Do you wish there had been just one business class at art school? Are you facing more questions than answers related to your craft business? Our very own Jacqueline Sava has the solutions for you. From Maker to Making a Living is a workshop series designed to guide craftspeople through the process of understanding, designing and building their individual businesses. Led by maker and award winning business leader Jacqueline Sava, attendees will be guided through an eight-part series of lectures, exercises and activities focused on the development of their own craft-based business practices. The knowledge and skills obtained in these workshops will allow makers to successfully balance their personal craft philosophies with the realities of marketing, selling and profiting from their businesses. At the end of the workshop series, each craftsperson will have a custom plan to ensure a successful transition from where they are to where they want to be, and balance their personal craft philosophy with the realities of marketing, selling and profiting from business. • Monday, October 3: Myth busting. Making money is okay. • Tuesday, October 4: Options. Exploring without losing your soul. • Tuesday, October 11: Personal branding. Understanding your purpose. • Wednesday, October 12: Business goals. Defining a vision. • Monday, October 17: Costing per product. Am I really making money? • Tuesday, October 18: Costing in general. All the other expenses. • Monday, October 24: Selling. Wholesale, retail, pricing, and all that jazz. • Tuesday, October 25: Charting the course. Deciding which way to go. To register for this course, visit the Ontario Crafts Council website here. As you may know, we are big fan of continuing education and ongoing professional development. Here’s how summer reading contributes to ongoign learning at the Soak office. Summer book clubs. Oprah had one, elementary school suggest them, my mom is part of one as is my best friend. We have our own version here at the Soak office. Each person selects two books. Why am I interested in this book? What drew me to it? Where did I hear about it? How is the content of this book going to help me be more effective in my job? How is the knowledge gained from reading this book going to contribute to a culture of learning at Soak? 4. In the fall, we have a luncheon round-up where each person tells everyone else about their reading and learning experience. That’s it! My summer reading? I was the first to pick this summer. I am reading Sean Moffitt’s new book Wikibrands. Sean is a good friend and brilliant marketing guy. Check him out if you haven’t heard of him. I’ve also suggested Ngoc, our awesome marketing coordinator read this book. Sometimes I suggest books, sometimes I get introduced to new books! My second book is a sequel to last year’s summer reading. The book strategy is the same as last year, we modified the ‘time in lieu’ part. Last year we tried to close early every Friday at 3pm (2hrs x 8 weeks = 2 days). We were always busy and it didn’t work so well. Anyhow, back to my books. last summer I borrowed ‘Pour Your Heart Into It: How Starbucks Built a Company One Cup at a Time’, by Howard Schultz from my friend Gilad. It’s a great story on building brand, business and selling great products. It’s no wonder I was interested in it. You should read it. So, this summer, on my recent road trip to Montreal, I picked up Schultz’ second book ‘Onward‘ available in-store for their 40th anniversary. I plan on reading it at the cottage while drinking my morning coffee. I think it will enhance the overall summer reading experience. Summer reading is important, so we stay up to date on current business books, biographies or whatever else is going on in the world outside Soak. If you work as hard as we do, you probably don’t have enough time to read either. We are busy, so it’s important to schedule in learning. We always want to spend more summer time in the sun, so in the summer, I offer up reading and relaxing away from the office. When the rest of our team sorts out their books, we’ll be sure to share them with you. I hope they do it soon, no reading, no extra sunshine! What are you reading this summer? What books would you recommend? Everyone thinks that if you just make a better mouse trap, you’ll be rich. Each business discipline has its own priorities in terms of mouse trap function and profit. As designers, we want to understand it all. Sales thinks… that without them, there is no business- your mouse trap is nothing, if I don’t sell it. Marketing thinks… if nobody knows there’s a new mouse trap, who cares? Finance/business thinks… if it’s just about the bottom line, the trap isn’t important. 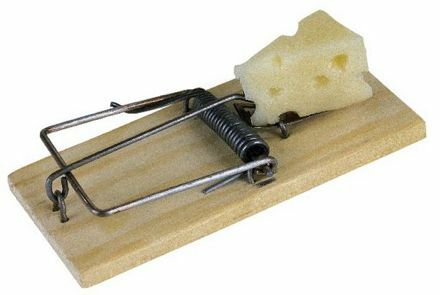 Designer thinks… if I design a better mouse trap, it will sell. Design must be all encompassing. One must understand all aspects and priorities in order to create useful products. In the second part of the design strategy course, we dive into marketing. We talk about marketing as part of the strategic mix, not to become professional marketers, but to be able to understand what marketing is all about when in a business or client meeting. We skim the surface of famed marketing terms such as the 4 P’s, (Product, Price, Place, Promotion), we look at types of products (core, functional, augmented, potential) and try to define the ‘true’ solution a consumer is seeking when they look at goods or services. We stop for a while on pricing products, understanding how value compares with price (why starbucks can charge 4x more for coffee than say, Tim Horton’s or the local gas station) and why people pay more for certain things. We close off understanding how to define consumer needs and target markets. When we move towards the world of understanding brands, we look at product lifecycles, adoption curves and a few other marketing fundamentals. It’s important to note that this marketing research is done in the context of the business strategy (which we learned how to analyze in the first part of the course). If we don’t have context, all the marketing research in the world won’t help our products succeed. That’s just my opinion, based on lots and lots of experience. You might have the same glazed over look my students did this week in class as you read over these topics. I’m okay with that. It’s not that our designer/ students need to master brand strategy. If they did, they’d go get degrees in Marketing. They need to be familiar with the concepts and terms, so they can work well alongside marketers and agencies collaborating on client projects. 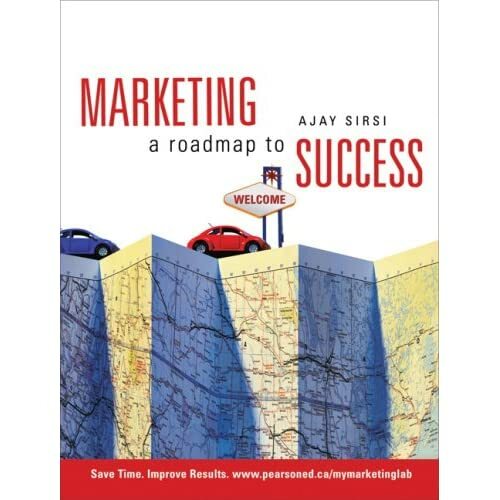 Should you feel the need to understand these points further, I would direct you towards our course text book, my favorite marketing book for non-marketing majors, ‘Marketing a roadmap to Success’ by Ajay K. Sirsi. Professor Sirsi was one of my MBA Profs at Schulich School of Business and he wrote this book to help simplify marketing terminology for us mere mortals, who don’t have the time for four inch thick text books. Happy reading. This Friday we are shaking things up. It’s time to put away our summer bags for a school bag fit for fall. We’re trading silk for leather, cotton for vinyl and soft sacs for sturdy back packs. Join us each Friday for Business’S cool. Stories to inspire and educate, from owner and founder Jacqueline Sava. Tuesday mornings you won’t find me at the Soak office. I’ll be held up in an interior classroom at George Brown College’s School of Design. My philosophies and practices combining design and business led me right to the Design Management program at George Brown. In class you ask? Well, I’m not taking classes, I’m teaching a class called Design Strategy. Essentially, I teach designers how to think and work like/with business people. I believe (and as a trained designer, I feel comfortable saying this) that designers should learn, at some point or another, that there is a whole world out there that doesn’t understand, speak or think design. More importantly, if we designers want to live in the real world, we need to learn to communicate, work and live in unison with business people. Most of the students have, like I do, undergraduate degrees in various design disciplines. They all want to work as design managers, design directors or key players in the corporate world, bringing design to the masses, or at least management. Each week (or so) I’ll bring you insights from the classroom. A sneak preview at what we are working on, great books to read, insights from students, and experiences from the Soak office. It is shockingly true, that nothing is more valuable than experience, and these days, we are getting more than our fair share. This photo was taken at one of our branding sessions. Education is a core value here at Soak. We not only educate our consumers on best practices with our product, but also continue to learn at the office as well. We are always seeking to improve, share and develop ourselves, as we develop the business. Feel free to send thoughts and ask questions. Sharing knowledge is my passion and I hope you can learn new things here, to apply to your work and life. The School of Design features many award-winning programs. Design Management draws international students together with diverse backgrounds such as Industrial Design, Fashion, Graphic Design, Advertising, Architecture, Interior Design etc. All students have work experience, ranging from one to several years, in various disciplines and countries. The richness of cultures, experiences and insights is staggering. There is nothing more rewarding than learning while you teach. This is my second year working with the brilliant faculty at the School of Design. In the past I’ve taught at Humber College (in both the Industrial Design department and the School of Fashion Business) as well as done lecture series with various business organizations. My background combining an undergraduate degree industrial design from an art college (RISD) and an MBA in strategy and marketing from SSB (York University) offers a unique combination of art and business, design and strategy. When I speak I try to bridge design and business enabling easy and enthusiastic communication from both perspectives. Next week, let the games begin. I’ve got my school bag ready. Do you have yours?